I am an employee of Laboratory of Molecular Genetics of Microorganisms, research assistant. I was born in Moscow in 1983. In 2001 I entered the Moscow State University of Food Production at the Faculty of Technology of fermentation and winemaking. Simultaneously I started working at the department "Fermentation and Industrial Biocatalysis" of Moscow State University of Food Production as training master. I graduated the university in 2007 as an engineer-technologist. Until joining the Research Institute of Physical Chemical Medicine, I worked a microbiologist at the company. 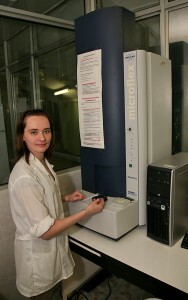 In the Laboratory of Molecular Genetics of Microorganisms I work since 2010. Applied research. Molecular methods for the identification and typing of microorganisms; formation of Enterococcus sp collection; development and introduction of new typing methods of Enterococcus sp. In the future: development and application of new scientific methods; modeling; collection and processing of initial information; analysis, correction and updating of obtained results; implementation of research results. Participation in the poster session ECCMID 2012. Poster № P1396. MALDI ToF mass spectrometry based methods for the characterization of enterococci.